Last year, research firm IDC reported that Q2 2018 saw PC shipments experience the first year-over-year growth in six years. Ultimately, however, the market declined across the entire year, thanks partly to Intel’s CPU shortages. And while Chipzilla’s issues are improving, they’re expected to keep hampering the industry’s growth, especially when it comes to entry-level device volume. IDC notes that gaming PCs may also face “short-term challenges,” thanks to Nvidia still working through its excess of graphics cards—a result of the crypto crash—and the high prices of its flagship RTX cards. The report expects the PCD market to shrink 3.3 percent in 2019, and that decline is predicted to continue up to the forecast period of 2023, when it will have fallen from 391.1 million to 372.6 million units, representing a compound annual growth rate of -1.2 percent. 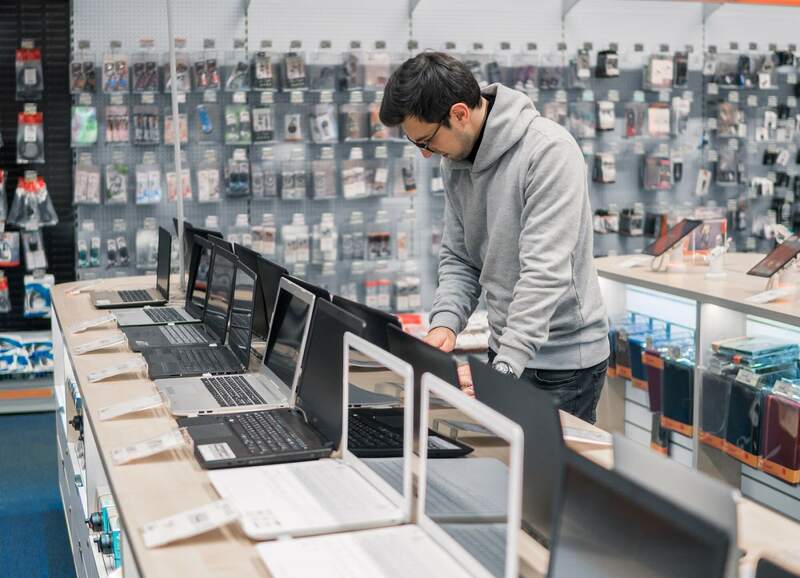 While traditional PC sales are expected to fall 0.4 percent between now and 2023, a large part of the overall decline comes from slates, which are predicted to drop by 4.4 percent. There is some good news for manufacturers of detachables; 2-in-1s look set to grow 4.6 percent over the next few years. 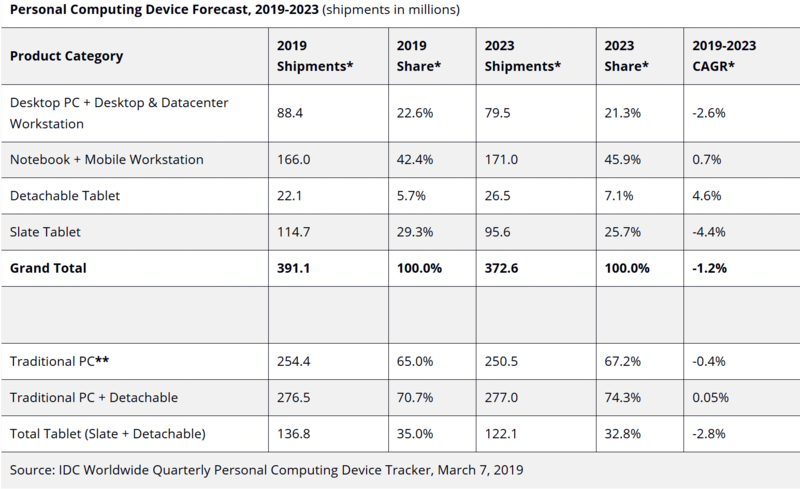 Although the commercial PC market is expected to see a small decline in 2019, the commercial notebook forecast has been raised. IDC adds that a large number of last-minute Windows 10 migration projects will complete this year, likely due to extended support for Windows 7 coming to an end. #1 Smartphones themselves - both in their abilities and their costs have caused a decline in computer sales. The same can be said for Tablets. #3 CPU shortage? But that has to be limited to specific types of CPU cause there's plenty of em out there that no one wants. I personally don't buy AMD. Not only because my motherboard is for my i9ex and incompatible with Ryzen, but because I don't want them. Therefore, there's an entire list of CPU I wouldn't be in the market for. As old PCs remain "good enough" for ever-longer, there will be obviously less demand for new PCs. lexster, MaXtor, p51d007 and 2 others like this. I disagree with the smartphone comment. People who build PC's aren't choosing to game on a smartphone or tablet. Top of the line smartphones are more expensive than mid-range builds. Decling CPU sales have to do with older generation i7s and i5s still being very good so people aren't in need of an upgrade as often as they are with their GPU. Smartphones have made it easier to do a large number of things traditionally done on PC. My other point is that smart phones are so expensive that some people don’t have the residual income to purchase a computer. I upgraded from a Core i7 4790 with a GTX 745 and 32GB DDR3 to a Core i9 7980 and RTX 2080Ti. Functionally, despite being over 3 years old, the 4790 could handle anything you threw at it - and with the SSD upgrade was fast doing Windows 10 tasks. The point: Computer software isn't stressing the CPU and GPU as much lately. During the 2000's software was aging out computers with a quickness. In september 2017 I have bought an i3 6100 for 112 EUR. Good I will be building a system in a few days. SSD drives dirt cheap, Ryzen 6 core dirt cheap, and RAM is reasonable again. That's INTEL for you. I will be buying an AMD 6 core RYZEN for $155 from Walmart. Includes Wraith fan as well. Black Paper, Markoni35 and Charles Olson like this. To me, a 0.4-percent decline in PC sales by 2023 does not seem all that substantial. Godel and Charles Olson like this. Best upgrade I did to my "aging" i5, was to ditch the HDD for an SSD about a year after I got it. If it is speedy running photoshop, it's "good enough" for what I use it for. People who build PCs is a minority. You can't play serious games, or do video editing, or image editing, or audio editing, or seriously surf the web using a phone. There are things for which phones are good, but they aren't competitors to PCs. I can't imagine having just a phone. I'd rather be a vegetarian for 12 months than be without my PC. Black Paper and Dimitrios like this. Buying a 2080ti pretty much automatically drives you out of what any reasonable person would consider the "normal" PC market. The typical buyer spends 1/2 to 1/3rd of what you spent on that GPU for their *entire* system. Same here. When my old video card crapped out I couldn't use my PC for about 3 days. I actually had anxiety and my cellphone and tablet wasn't really easing the stress. I'm still going strong with my i7 3770k (overclocked to 4.8Ghz). I have 32GB of 2400Mhz DDR3. The cost vs performance improvement of an entire platform upgrade is really not worth it in my opinion. I've had this system since 2012, it was coupled with a GTX 690. In 2017 I upgraded to a 1080 ti (overclocked 2100Mhz/12000Mhz). I get well over 100 fps in Pubg at 3440x1440@100hz. I'll probably do a full platform upgrade in 3 or 4 years when I'm ready to upgrade from my 1080 ti. SSD makes just about any computer feel like a new computer. The difference between SSD and HDD is like night and day. M.2 vs. Sata really doesn't matter for the mainstream. M.2 is only a few seconds faster when loading games. A 2080Ti is only $999 while more expensive models are $1300 - $1500. What would you consider "normal"? A 2070 is still $500 - $550. Many people don't have $300 to spend. I am against the idea that "normal people" have to be locked into a spending bracket. You can't play "PC Games" but I'm absolutely amazed at how much more cohesive playing games like PUBG and Fortnite is on my iPhone than the actual Desktop - which is plagued with bugs. I've edited pics and audio on my phone. Not professional edits but I've edited videos I've taken while out fishing and added (and edited) audio to the video. I think some people use tablets for this as well. People use phones today when they might have otherwise used a computer. You can't easily carry your computer in your pocket, pull it out while on the street and look up information. I can do that with my phone, with one hand tied behind my back. I "surf" the web frequently on my phone when I need to look up info or an address or want to know if a restaurant is any good. I use it for ferry schedules, traffic reports, tide reports when boating and I even used it on a foggy day to avoid commercial boat traffic out on the water. All of which could be done on a PC but in some cases it is not as convenient and for surfing the web I'd need a network connection or tether to my phone. If I'm going to tether I might as well just use the phone. My gaming PC is just one of the many computers I use on a daily basis which include my work laptop, my personal laptop, my phone and various tablets (Amazon Fire, iPad). I don't know how you're using "normal" in this case but my anecdotal comment is that if someone is just buying a computer for home use (not necessarily gaming) I'd say they spend between $500-1000 on average. If they build computers, like I do, they may spend between $1000-2000 on a build which also depends on whether they are building from scratch or have reusable components. I think I'm on my third mobo in the same case and same power supply. I may upgrade the GPU in the next year and I'll spend between $200-400 when the time comes. People buying $1000 GPUs are generally what you might call enthusiast or hobbyist. These are often times gamers, currency miners, or video/audio editors. The number of people who spend $2K or more on a PC is much lower than it was even 5 years ago. I don't think people have to be locked-in to a price range, though in the real world our spending habits are generally bound by what we can afford.